Appearance: With the slightest build of the three males in his litter, Asch has worked to become athletic, resulting in a well toned appearance. His muzzle is broad, and his ears are slightly too small for his head, although quite flexible. Asch has high cheekbones and chubby cheeks, but a good deal of that mass is thick fur. Ascher's fur is mainly a mixture of coppers, which have become richer during his adulthood, and more muted blacks and browns. His underside is a paler brown, less rich in colour but complimenting the smallest Stormbringer's top coat. The textures, coarse and thick on top, shorter and softer on Ascher's underside, are equally harmonious, although there are often a few stray tufts of the wrong length or colour which stop it from being uniform. His piercing blue eyes tend to be focused and curious, and he often wears a pensive expression, but his movements are generally passive and gentle. 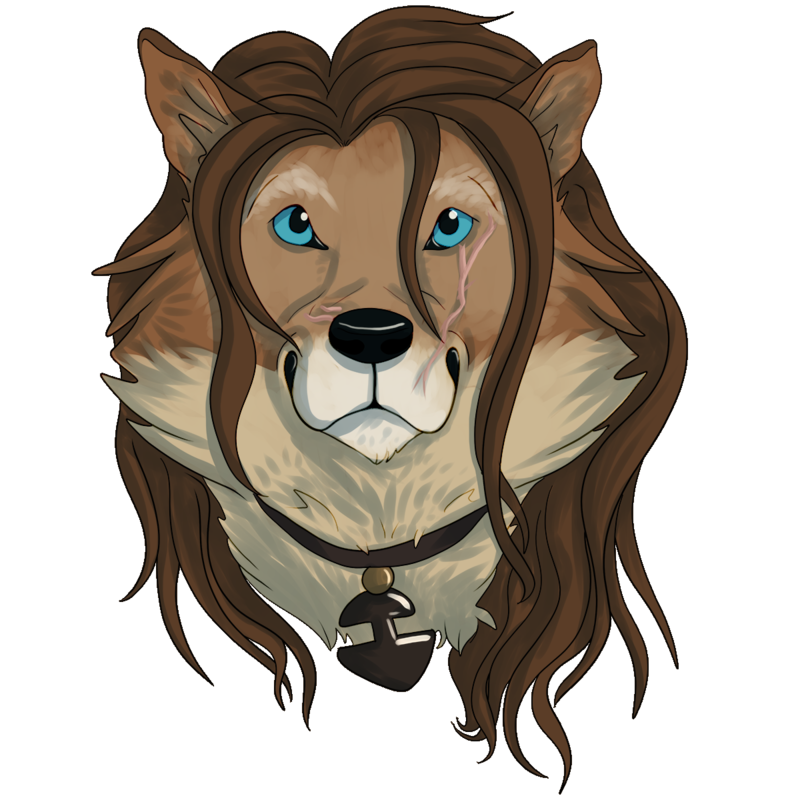 Ascher has gained a single scar on his journeys: a slice to his chin, extending down his neck a few centrimetres, which hasn't yet allowed the fur to grow back through the scar tissue. With his fur being thick on his chin and throat, this makes him look almost as if he has a parting forming whiskers. Personality: Ascher is a shy and quiet fellow; timid, but not entirely fragile emotionally. Around those he doesn't know he's often nervous and tries to stay in the background, but if you catch him with his family or engrossed in a task he has a quiet confidence about him. He certainly isn't fragile mentally: born with wits and a true lover of learning, Asch is ever curious, eager for knowledge but not demanding it. He has good manners but he can also take things too literally which can lead to misunderstandings; he has to be reminded when people are being sarcastic or joking, although his sense for this will hopefully improve. Asch was very close to his family and holds them in high regard. He's extremely protective of and loyal to those he loves, and although he will go to any length possible to avoid a physical altercation, family are those he would fight for. Secretly, though, Ascher has a complex over the physical differences between himself and his siblings. This means he has a passion for training his body, as well as learning. When it comes to women, Ascher is very inexperienced and tends to get flustered around unknown females. Sometimes this leads to blurting of random facts. Biography: Born as the result of a taboo tryst between a Stormbringer and a Dawnrunner, given the conflict, Ascher's life wasn't always going to be a happy one. He loved his family, but the first family member to be lost to him was his mother, Abigail, when the pups were still very young. The perpetrator, Abigail's mother, left the pups on the mountainside and eventually they came across a relative who took them in. But soon Dreyrugr tracked his illicit children down and demanded that they return to the Solbjorg with him. Eager to please the father he'd not had much of a chance to know, Ascher agreed to return, with Saul and Shiloh, while Gideon refused. However, during the journey, a wild storm ripped the family apart, with Saul and Ascher both getting lost. In time, Ascher made it back to Dahlia de Mai and was reunited with his siblings. When the litter came of age, Saul gave Ascher a doe pendant which he still wears. It may have been his happiest time. Not long thereafter, a snowstorm hit 'Souls and Ascher was blown away by the wind and ice. Although his life wasn't threatened, at times he was disoriented. A small owl took to following him, alike to a guardian angel if he hadn't been such a temperamental bird. It seemed the creature took a liking to Ascher, bringing him small rodents and other treasures, and they travelled together back to the Solbjorg. Ascher didn't plan to stay long, but he ended up staying for several months, waylaid by his thirst for knowledge and experience. Eventually the desire to share the knowledge he was gaining with his siblings became dominant, and he and the tiny owl he had named Archimedes began to make their way back to 'Souls and the people who had been there since day one.